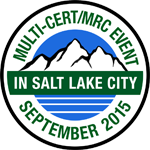 This year's Multi-CERT Event and Training will be part of a Safe-Neighborhoods training exercise at Edison Elementary School in Salt Lake City. Other groups will be at the school participating in other parts of the larger training relative to thier roles. Participating CERT members will play the role of CERT trained nieghborhood residents that gather at the school after a disaster. There they will form teams and get canvasing routes to check nearby neighborhoods for fires, damage, injuries and hazards that are then reported back to the IC. Four different sessions will be held, a half a hour apart, that will include a JITT (Just-in-Time Training), team formation, team assignment and team de-brief. Lunch will be provided at the conclusion of the event.